I've been contacted 7 times in 3 days from some visitors around the world who "crossed over" to my blog pertaining to my Wind posts. Some also came across from YouTube, but generally they were asking similar questions. I'm happy that my posts were helping others (since I am not a full time blogger and tech reviewer) to make their decision, to find answer to certain question like "could I install Vista onto Wind" and so forth. Now I decided to blog this post in response to these questions and other aspects that I have not covered in previous posts. In my previous posts, from the comparison matrix to supplement the decision making on which model, to happily got myself the Wind, followed by Part 1, Part 2 and Part 3 as you might have read through, it's purely from a consumer and dummy user perspective without much coverage on the technical aspect since there are plenty technical reviews you can find in the net. This post will be slightly techie sound and I will try to put it from other aspects. As of today, there are several variants and models of Wind flooded the markets globally. 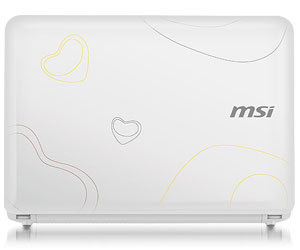 From the initial 80GB HDD, with only 3-cell battery and 4 color options to choose from, now MSI offers 120GB HDD, 6-cell and additional "Love Edition" shown above to add to the color options (also with a change from Synaptic touchpad to Sentelic touchpad). It's still called MSI Wind U100 despite the change of spec. In some other countries (I guess majorly in European countries), it's offered under a different brand name called Advent 4211. One of the readers mentioned that he discovered it's indeed an MSI Wind U100 after the sticker at the bottom was teared off. There is another model, the U90 with 8.9" screen which is out of topic here. Mine is the first generation of Wind U100x model number MS-N011 (as per the label at the bottom) with the spec below (visit MSI Mobile for details), pre-installed with Linux operating system instead of Windows XP Home. I did not specify the spec previously because there's no other options available when I bought it. Read the Part 3 you will know why I got myself a Linux than Micro$oft box. The only hardware upgrade I did was the memory RAM to 2GB. To repeat, a 2GB RAM stick was in fact slotted in but Wind refused to boot up, even the power button was not lighted up at all. MSI has released a BIOS upgrade, the question is whether 3GB RAM is supported with this upgrade. Perhaps I shall bring my Wind to an IT store for a try on luck again. This upgrade to total of 2GB RAM is required if you plan to load Windows Vista onto Wind, otherwise the default 1GB should be sufficient for Windows XP. I did not upgrade the harddisk as I was told by the MSI dealer that it would void my warranty. Perhaps a 250GB or 320GB upgrade upon warranty expiry would be good to use Wind as my photo albums storage. On the other hand, I would love to get myself a 6-cell model at that time, but it wasn't available due to battery manufacturer's fire incident. I shall recheck with the dealer if it's now available as accessories purchase. As far as I know, Wind is still the better choice (if not best) in the market now with strong contender from Asus Eee PC 1000 series. There are other products like Acer Aspire One and Lenovo S10, but I guess I would not change my mind to get Wind even if I had not bought one. Why? Check out the spec of the rest, some minor thing like only 2 USB ports really affect my decision and of course the cost $$. Loading Vista is simpler compared to previous version of Windows such as Windows 9x and Windows XP. The only issue is to get an external DVD drive (Vista Setup Disc comes in DVD format) if you do not have one. Alternatively, you may try to copy the entire DVD to a high speed and capacity USB flash drive, press F11 during MSI logo screen and boot up to the USB drive. It might work as if you are installing from DVD drive, though I did not try on this method. A 8GB flash drive is suffice on this. Again, if you are adventurous, replace the flash drive with an 8GB SD Card, give it a try! I bet if it works but the installation progress might take unexpectedly longer to complete due to the card speed. Take note the flash drive and SD card need to be in bootable format. An in place upgrade from the pre-installed Windows XP Home is possible. You can copy the Vista setup disc content to the hard drive or other supported media mentioned above. The only difference is to boot up to Windows XP and double click on the setup.exe to begin the upgrade. I always dislike such upgrade because there are many rubbishes and mess left over after the upgrade. A clean install is always my preference. If you are an experienced techie, you may want to "vLite" the Vista installation to gain a little more space. As its name suggests, v = Vista and Lite = lighten or Lite edition. With vlite, you can remove some features that you are certain you will never ever need them. For example, the Windows Welcome screen and some legacy printer drivers. I slightly "vlited" my Vista Ultimate gained me a little space of 7GB+, a total of 15GB Vista installation compare to 23GB of default Vista installation. No worries on driver compatibility for Vista. If your Wind package came with a Driver / Utility CD for XP, you can rest assure that ALL drivers work for Vista include the Bluetooth. If you browse through the folders like above, you can find some folders like Vista or Vista64, meaning that both Vista 32 and 64 bits are supported! If you don't have the CD, then go to MSI Download Page to look for latest version. Just run the setup.exe for each hardware driver, follow the on screen instructions and you will have hassle free to get every single piece of hardware component in your Wind to work like a charm! 1. Webcam - firmware is provided by MSI at the Download Page, but you may not find the driver. 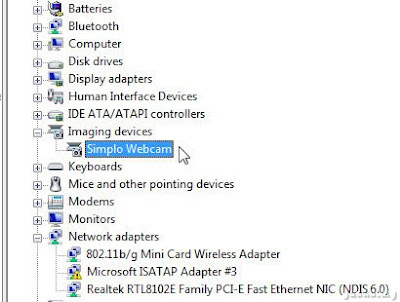 Download and install Vista SP1, Vista will automatically detects and installs it (make sure the webcam is activated by Fn+F6). If it does not, run Windows Update, scroll to Optional upgrade and you should find an update called Simplo Webcam. Download and install it. 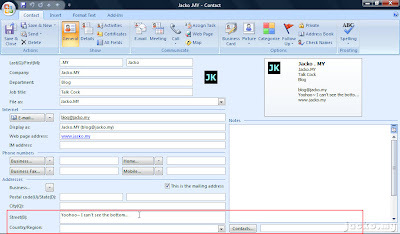 To try it out, launch any of your instant messenger like Yahoo! Messenger or Live Messenger. 2. 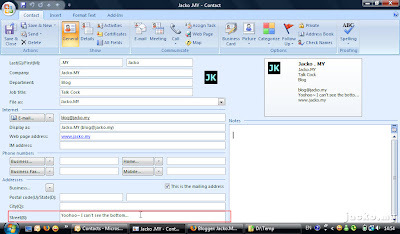 Aero interface (HOME button + TAB) - ALT+TAB is used to switch between programs in XP. You can use HOME+TAB to switch programs in 3D mode. The default driver from MSI does not allow this feature to be activated. Run Windows Update and install Windows certified video driver, Aero should be automatically activated after reboot. Do you notice Microsoft ISATAP Adapter #3? Don't panic if you see this in your Wind (or any other Vista machine), nothing wrong with it, it's by Micro$oft's design error. You can uninstall it but occasionally it will bug you again. After more than 2 months of using and running through 88 security patches and updates from Windows Update, Vista does not show any degradation in performance (touch wood~). The boot up time is more or less similar to what I timed right after the fresh install, sometimes psychologically I felt it's faster than previous. Wind shows no lagging in multitasking most of the times, with multi-tabs Firefox, Yahoo! 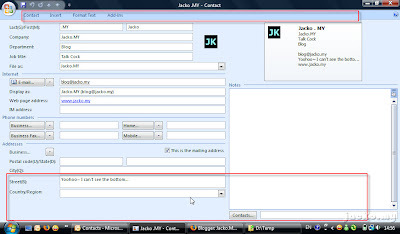 and Live Messenger, Microsoft Outlook and iTunes streaming MP3 in the background. There were few occasions I was video conferencing using Live Messenger, thumbs up on the performance with no lagging at all except the network latency caused by the lousy local broadband service. It did not happen all times, there was delay when you see the hard disk indicator LED was blinking rapidly, I guess it was due to the Index service rebuilding the search index, I reconfigured the Index service to index my entire C (system) and D (Data) drives. I did not diagnose further 'cause it's acceptable to me. Can you find the OK, Cancel and Apply buttons? 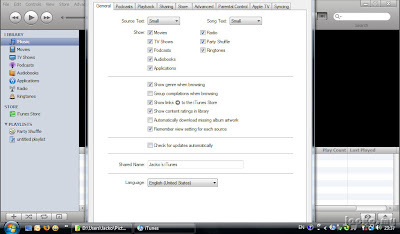 Some programs dynamically support this resolution, for example the Bluetooth software. When you hover the cursor to the bottom, the dialog box automatically "pushes" itself up a level to show the 3 buttons at the bottom for you to click. Also, you may encounter the same issue in some Adobe Flash animated websites. Press F11 to go full screen in browser might address the issue if the Flash content is coded with dynamic sizing. You can also try to get some freeware to resize the resolution permanently. Try search in download.com and you easily find dozens. There is one called Downscaling Switcher developed by a kind Wind user in Wind forum, seems getting good feedback, worth a try I would think. I don't see this as a problem (since there are workarounds) on Wind (and other netbooks with similar resolution), it's merely a matter for the web developers to be more dynamic in developing the web to support it since netbook is still a very new segment in this era. I guess HP Mini 2133 does not have this issue 'cause its resolution is the standard 1024x768. 2. Just a small matter... There is clipping noise whenever I play Flash content or video from internet like YouTube videos or Justin.TV. Not very loud nor is it annoying but it's noticeable. Such clipping does not happen when I play MP3s and videos from my hard drive. Perhaps tweaking the Audio Manager could get away the noise but since it's bearable to me, I do not bother to troubleshoot :) Let me know if you found resolution.